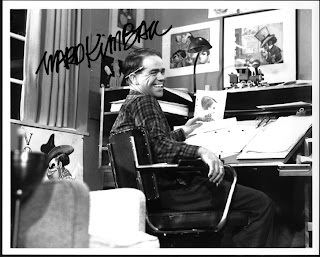 Casey Jr. was created by the one and only Ward Kimball. I could devote an entire blog to covering every aspect of this man and still only scratch the surface, so this will be topic I'll be revisiting often. As one of the famed "Nine Old Men," he was a prized feather in the hat of the Disney studio and was highly respected by Walt himself. Ward's love for trains shone through his animated work on several occasions. If a train appeared in a Disney film, Ward undoubtedly had a hand in its creation. This autographed image of Ward taken during the filming of The Reluctant Dragon is a recent addition to my collection. What I found particularly interesting is the maquette of Casey Jr. sitting on top of his animation desk.